Vince tee in striped silk-blend knit. Approx. 19"L down center back. Eileen Fisher striped jersey tee in organic linen. Square neckline. Short sleeves. Relaxed fit. Vented sides. Straight hem. Pullover style. 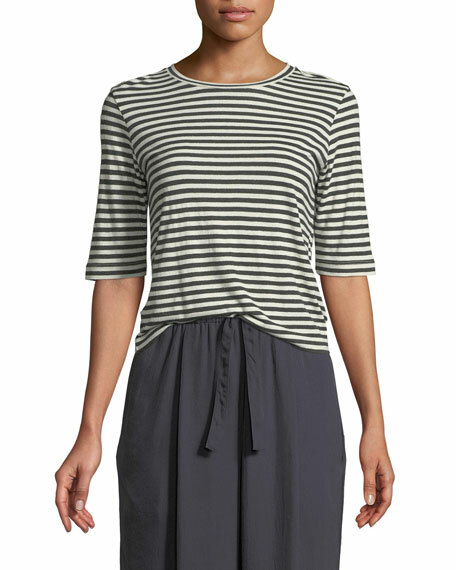 Eileen Fisher striped jersey tee in organic linen. Square neckline. Short sleeves. Relaxed fit. Vented sides. Straight hem. Pullover style. Organic linen. Hand wash. Imported. Model's measurements: Height 5'10"/177cm, bust 33"/84cm, waist 25.6"/65.2cm, hips 35.8"/91cm, dress size US 2-4/FR 34-36. Josie Natori embroidered tee with a solid cami. Approx. 21"L from shoulder to hem. Round neckline; contrast trim. Short sleeves; contrast trim. Relaxed silhouette. Cropped length. Even hem. Pullover style. Silk/polyester/viscose/wool. Cotton lining. Imported. Model's measurements: Height 5'10"/177cm, bust 33"/84cm, waist 25.6"/65.2cm, hips 35.8"/91cm, dress size US 2-4/FR 34-36. St. John Collection "Brisa" T-shirt multicolor striped knit. Crew neckline; button/keyhole back. Short sleeves. Relaxed fit. Pullover style. Rayon/wool/nylon. Made in Italy. Model's measurements: Height 5'10"/177cm, bust 32"/81cm, waist 24.5"/62cm, hips 36"/91cm, dress size US 2/4. Tory Sport tee in Breton Stripe tech knit. Approx. 20.5"L from shoulder to hem. Wrinkle-resistant fabric holds its shape. Scoop neckline. Short sleeves. Chest patch pocket. Pullover style. High-low hem. Viscose/polyester. Dry clean. Imported.